I am in Kansas, visiting my parents. My Dad’s radiation and chemotherapy were both supposed to start this week, but the doctors are still trying to figure out the radiation part of his treatment. I’ve been here since Tuesday and since my Dad hasn’t started his regimen yet, it’s been kind of a lazy few days. I saw some friends from high school last night. We caught up at a restaurant and someone suggested we go to the park to look at the newly restored fountain. It was my third trip to the fountain in three days. We laughed and took pictures and, I’ll be honest, it didn’t feel like a bunch of middle aged friends, on escape from our adult lives, it felt more like being back home for the summer, in between semesters of college. It’s so easy to fall into a familiar rhythm. Here I am typing this in my childhood room. My pennant collection still lines my walls. My U.S. map bulletin board still hangs above my desk. One can see the spots on the map where I wrote “Independence” in Kansas and “Sand Springs” in Oklahoma (because my church camp crush lived there) and “Guiding Light” in Springfield, Illinois. With few exceptions, the room is the same as the day I graduated high school. More than once this week, I’ve thought, hey, I could get used to this. I’ve even cut my antidepressant in half. There are moments when I forget why I am here, on loan from my regular life. It’s been really nice. Before I came, my parents and I talked about getting rid of unwanted stuff while I’m home. I’ve been throwing out folders and class notebooks from my bedroom and we hope to have a garage sale next weekend. (And we hope for cooler temperatures to make that garage sale more bearable.) Tonight, my Dad and I went through three of the 4 freezers they have, tossing out anything with a date older than 2012. (Anyone want a refrigerator? We have 3.) It wasn’t too contentious though a couple things my Dad vetoed because he didn’t want to lose the Gladware the frozen items were housed in. A few years back, my parents bought themselves a food sealer. I don’t know how much they paid, but they surely got their money’s worth for the joy it brings them. 4 oz of leftover ham? Perfect, we’ll seal it! A half eaten baked potato? We can pull it out of the freezer in December and reheat it! That December comes and goes and that the 1/2 potato lives three winters in the freezer, in a way, is irrelevant. I think they just like knowing they have lots of food. If someone comes over, they can pull out homemade salsa or apple butter. One of the things my Dad handed me to throw away was a sealed styrofoam container. I didn’t ask. A couple minutes later, he handed me another identical sealed styrofoam container. And then I remembered, yes, the cinnamon rolls. I always think everyone knows this, but since a complicated cancer-removing jaw surgery in 2012, food has not been his primary source of nutrition. He feeds himself through a tube in his stomach. Several times a day, he pours water and cans of an Ensure-like product into that tube. He does drink a little coffee and eats some cookies, but his relationship to food, to say the least, is not what it used to be. And I know what you are thinking, it’s what I am always wondering, would I be able to have a rich life without enjoying one of the things in this world that I love most? I’d like to think I would, but I don’t know. The first Neewollah after his surgery, he bought a cinnamon roll downtown, at the same stand he’d bought one for the last 40 years. He couldn’t eat yet, so he sealed it and put it in the freezer. The next Neewollah, still not eating regularly but with the same hope that he would eat again, he bought another. They were the goal he gave himself of what he would eat when he could eat. And, now here we are, five years later. Anyway, tonight, after the cinnamon rolls, my Dad handed me a few other items and I started bagging it all up to cart outside for the morning trash. He said he was going to go inside to collect more trash. And I stood there alone in our garage, this hot, sticky, familiar garage. 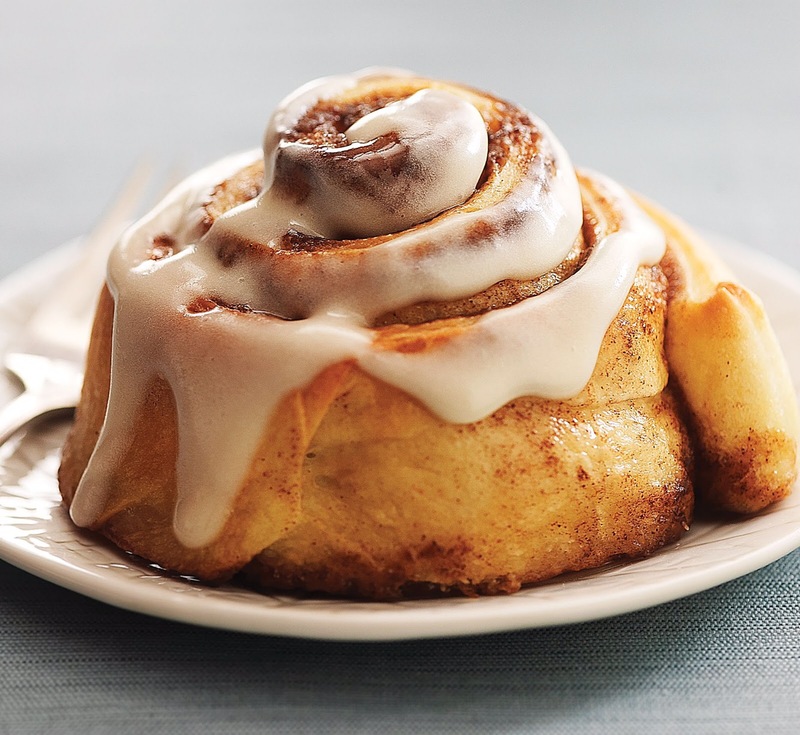 All I could think about were those darn cinnamon rolls. I told myself that if he COULD eat a cinnamon roll, he should surely eat a fresh one instead of these old, crystallized objects. But also, I wondered what might it mean, to him, to my Mom, to me, for those rolls not to be there. When is a baked good more than a baked good? Well, I think, maybe, it’s more than a baked good when there is some kind of hope attached to it. So, when my Dad came back to the garage, I told him I had put the cinnamon rolls back into the freezer. He didn’t sound surprised. “You didn’t have to do that,” he said. I think one of the gifts of living, of Life, is exactly what this piece touched on so lovingly: the value of things just being there. Like great writing like this. Beautifully written Ray… I felt I was with you during the entire time. Perhaps because I know that town, I know that fountain and I know that “cinnamon roll” you put back in the freezer. Keeping y’all in my thoughts & prayers. Loved the family selfie! You’re a good son & it shows. Absolutely love this! So glad you got to hang out with them, the pics were great! Sometimes I marvel at my husband. For 20 years this Fall, he has never been able to eat to well. Five years ago after surgery it’s been impossible. His garden flourished and he couldn’t eat it. His greatest pleasure is seeing others enjoy it. He calls his garden and yard his therapy. He is so strong and the few vanilla cream sandwich cookies and coffee in the morning may seize too. ❤️❤️❤️Love this so much, Ray. Beautiful writing. Shows soul, compassion, insight, and love. Great post. What a sweet, sweet family you are (I just read your mom’s comment). Hope to see you and your parents in the next couple of days while I’m in town too! Ray, this is beautiful. So full of life, love and family. So heart warming I had to wipe a tear. How is it I love and care about these people I’ve never met…including you…except through your words? And there’s the answer. Those words, your words, put together so well. Thank you for sharing yourself and your family.